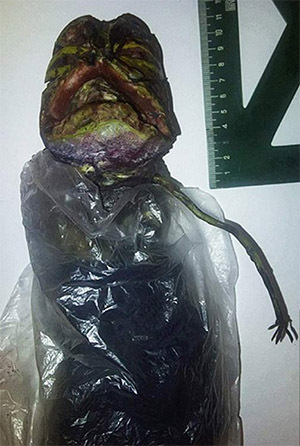 A Russian woman has released photos of what she claims is a small alien corpse that she has been keeping in her fridge. Marta Yegorovnam claims she found the corpse among the smoking wreckage of a UFO crash near her home in 2009. Unfortunately the corpse itself is no longer available, as it was allegedly confiscated by staff from the Karelian Research Center of the Russian Academy of Sciences. The White House has issued an official response to two petitions calling for UFO disclosure. Both petitions were essentially the same; the first called on the President "to disclose to the American people the long withheld knowledge of government interactions with extraterrestrial beings" and the second "to formally acknowledge an extraterrestrial presence engaging the human race". To absolutely no one's surprise, the response begins: "The U.S. government has no evidence that any life exists outside our planet, or that an extraterrestrial presence has contacted or engaged any member of the human race." You can see the entire response with the original petitions at the White House petition website. In a first for Ireland and a rarity anywhere, a coroner has ruled the death of an elderly man was caused by spontaneous human combustion. Coroner Dr Ciaran McLoughlin noted that it was the first time in his 25-year career that he had recorded such a verdict.